Borax Anhydrous or Anhydrous Borax is a highly concentrated source of boric oxide for glazes (which also brings Na2O, it is sodium borate). 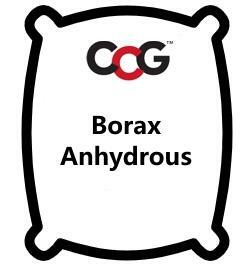 Anhydrous borax is made by fusing hydrated borax into a glass and regrinding it. It thus contains little or no water of crystallization. The powder does not rehydrate under normal dry storage conditions. It is somewhat water soluble, but considerably less so than raw borax (in aqueous solution it can thus provide slow release of boron). This material does not puff or swell during melting (minimizing loss of powder in kilns with strong drafts), and melts easier (the swelling in other forms can create a porous state with an insulation factor that slows melting). Anhydrous borax is an excellent glass former since its boron content is so high (and the accompanying sodium is a strong flux). This material is used as a source of B2O3 in the manufacture of many different types of borosilicate glass, including heat and chemical resistant glasses, illumination glasses, optical lenses, medical and cosmetic containers, hollow microspheres and glass beads. It has a higher bulk density and melts more rapidly than raw forms of borax.